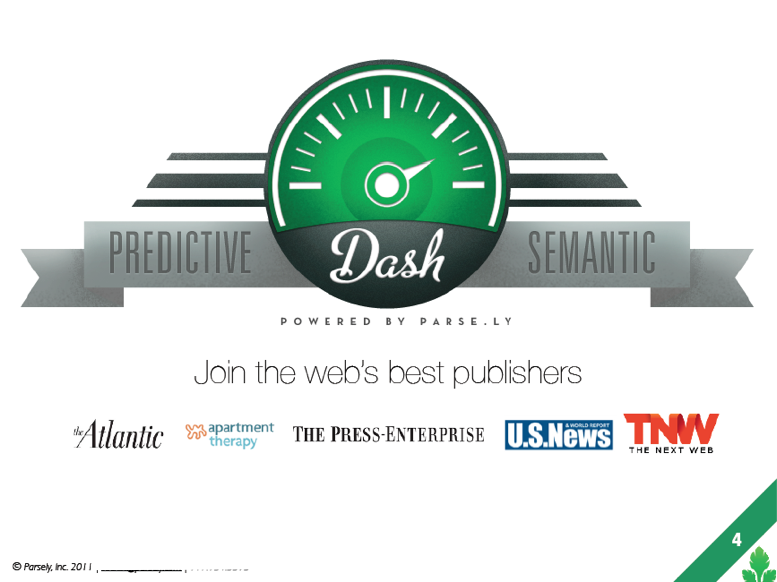 Parse.ly, the stealthy data-driven predictive content optimization platform for publishers, is preparing to launch its first product called Dash at the end of the month, we’ve learned. The startup first emerged from DreamIt Ventures in 2009, with $20K of seed funding in tow. It raised an A round from ff Venture Capital and Blumberg Capital in December 2010 totaling $1.8 million. 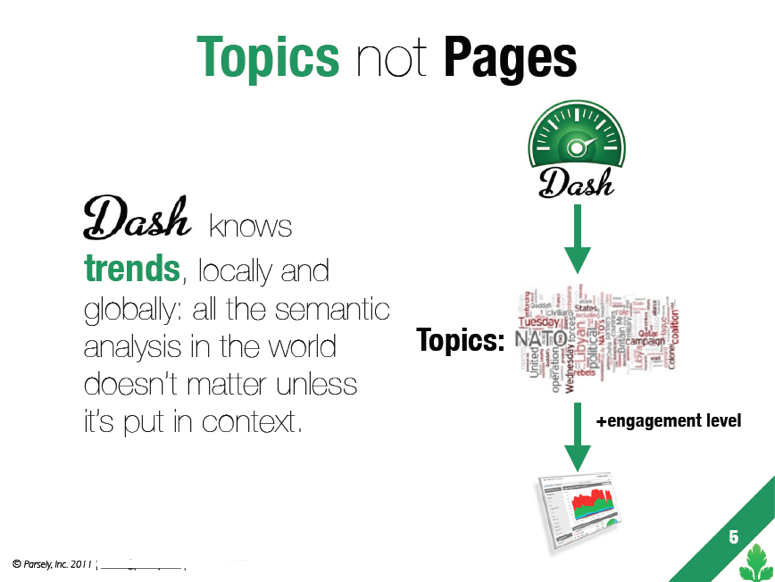 Dash aims to help publishers increase pageviews by providing insight into what topics are trending and what topics they should write more about or less about, among other things. 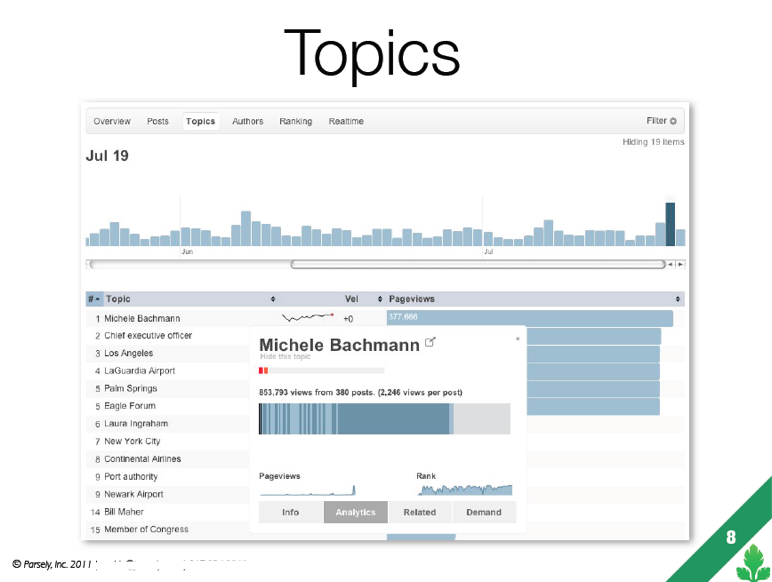 But most importantly, its predictive analysis engine is able to recommend what topics publishers should cover right now to be on top of future trends. Simply put, it’s a pageview-generating machine. The company is currently pitching publishers using a slide deck (see below) that explains how Dash works. 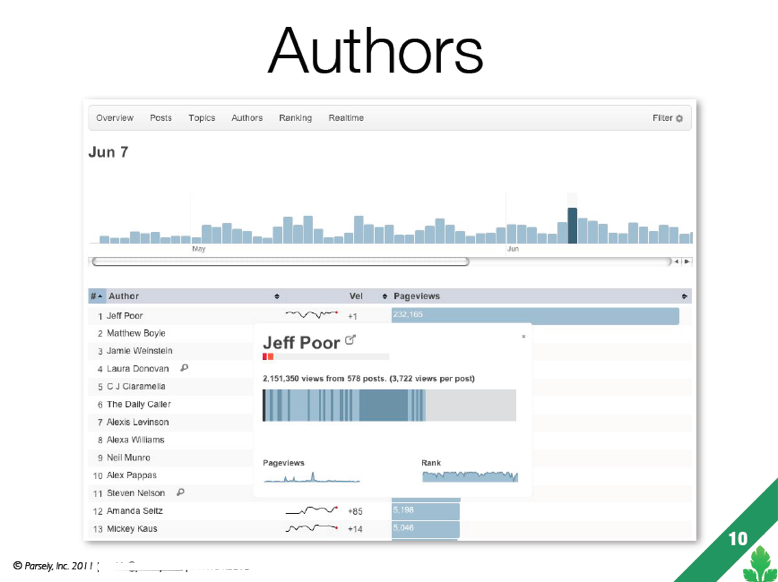 The pitch positions Dash as a third type of analytics service for publishers. Where Google Analytics tells you what has happened and real-time analytics providers like Chartbeat tell you what’s currently happening, Dash aims to tell you what will happen. To do so, Dash analyzes how a publisher’s content matches demand in order to provide “predictive, actionable insight to drive additional pageviews,” reads the deck. 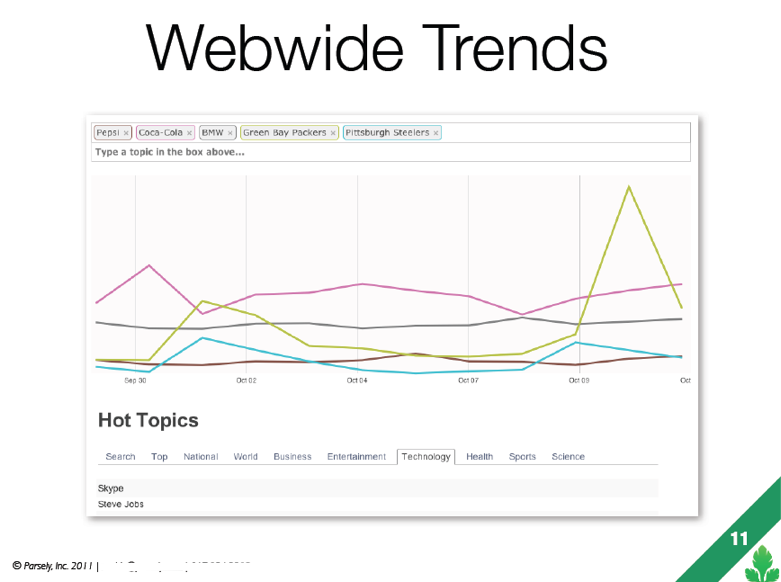 It does this using semantic analysis, telling publishers what topics are most in demand on their website itself as well as across the web, plus how fast topics are trending. 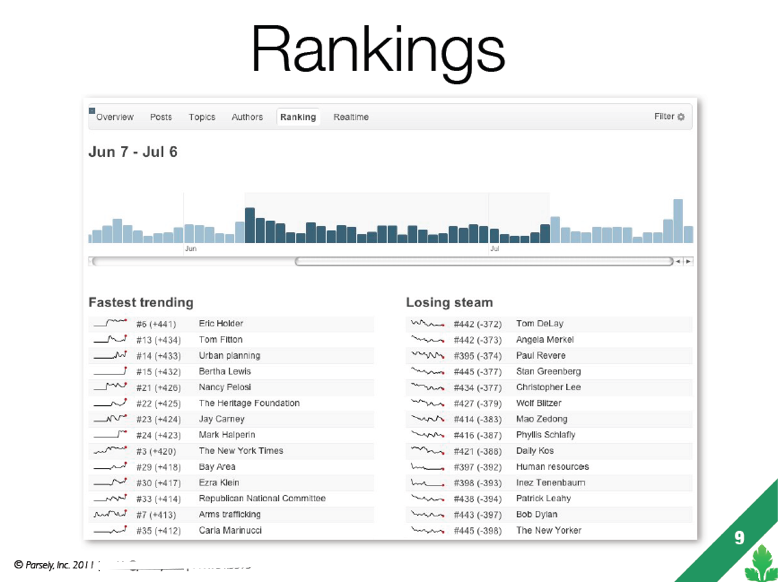 In addition to content analysis, Dash can also track trends related to individual authors, showing who’s the most read on which topics, who is getting the most inbound links, etc. Of course, there’s a fine line between staying on top of trends to keep a site relevant and simply writing for pageviews based on trends. As TechCrunch contributor MG Siegler explained last year on his personal blog, getting pageviews has become something of a game for publishers, and some do so using less-than-savory tactics (e.g., linkbait, headlines stuffed with SEO keywords, slideshows and writing posts based on current Google Trends). What Dash does, in theory, is to legitimize this pageview-pumping process through the use of data that helps provide better insight into what content on a site does well and why, as well as what content will do well in the future. It’s actionable data that publishers can choose to use (at their discretion) to boost the number of pageviews for their site. Many authors, readers and publishers alike, lament the fact that pageviews are driving force for monetizing web content today, but it’s the stark reality of the situation. Until improved metrics take hold with advertisers, it continues to be the “era of the pageview.” Given this situation, Parse.ly should have a goldmine on its hands then with Dash. Parse.ly was founded by Sachin Kamdar (CEO) and Andrew Montalenti (CTO), who met while attending NYU. Originally, word was that Parse.ly would function as some sort of consumer-focused news service. Clearly, focusing on publishers’ needs is the better idea here. Dash will launch publicly in late January.